Sick & Tired Of Dog Barking? Had enough of your dog's annoying barking at other dogs & people. Learn from the professionals & curb your dog's barking today! Learn how to take control of dog barking & howling. Online dog training guide for barking, whining, howling, aggression & more. Why do dogs bark? The answer is simple: dogs bark because they are telling you something, communicating with other dogs, or expressing an emotion. You've probably seen your dog with another dog at some point and watched how they interact. Dogs will bark at each other when they play or are just hanging out together. Unfortunately, we are only able to guess at the meaning of this barking behavior. However, when dogs interact with humans, the meaning of their bark is a little easier to understand. A simple way to understand barking as it relates to people is to compare it to a baby crying. Babies cry when they are hungry, sad, bored, lonely, need to be changed, sick and so on. When asking yourself, "Why do dogs bark?" the answer is no different. Your dog's bark will tell you when they are ready to have their dinner, when they need to go outside, when they aren't feeling good, when they would like a treat and more. It's learning to decipher just what that bark means that could take you some time. Once you have had your dog for awhile, you will begin to develop an understanding of what the barking behavior means much more clearly. Why do dogs bark at nothing? They don't. It may seem like there is no reason for the barking behavior, but that is not always the case. When you feel that your dog is barking for no reason, start to consider the possibilities. Are they hurt, hungry, ready to go for a walk or have them spotted someone outside your home? We may not notice some of these smaller things going on around us, but your dog will. If your dog is barking at the walls or at something non-existent, there my even by a psychological or health reason for the barking, so you may even want to have your dog checked out by the vet. Why do dogs bark nonstop? Try watching your dog to figure out what the meaning of their bark is. Often, if you watch them, a dog will point with their nose in the direction of whatever it is they want while barking at the same time. If you notice that your dog is barking nonstop and standing right next to the cupboard where you keep your doggie treats, then you've just figured out on your own what he or she wants! Dogs frequently show this behavior, and it's up to each owner to pay close attention to their pet to figure out what their bark is telling them. Barking non-stop means that there is a need not being met. In some cases, training will be required to curb the behavior, because that need may not be met all day every day. Why do dogs bark when you are telling them not to do something? Not all dogs do this, but if yours does, you can relate it to a teenager talking back to a parent. If you've ever been telling your dog to be quiet, sit, stay or to stop chewing on something only to have them begin barking at you or making another noise, they are talking back to you. It's their way of being defiant toward you. You will need to use some deference training to teach your dog that you are the boss to curb this defiant behavior. 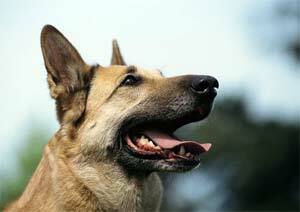 Knowing why your dog barks is key to curbing the behavior. Some barking behavior is simple to curb by meeting easy needs like providing food, water, or a trip outside. However, barking behavior that is a result of separation anxiety, fear, or dominance needs to be curbed with training before it escalates into more aggressive or damaging behavior. Put an end to your dog's excessive barking & other problems. Take Control of embarrassing dog barking in public.